The e-POP Fast Auroral Imager (FAI) measures the large-scale auroral emissions in the 630-1100 nm wavelength range. 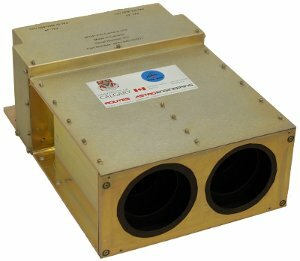 FAI is a dual CCD/single controller camera that can image the topside aurora in the region of the satellite magnetic footprint. The camera heads are equipped with f/4 optics, reduced to f/0.8 via a fibre-optic taper, and filters that allow simultaneous observation of the near-infrared band in the wavelength range of 650-1100 nm and at a monochromatic wavelength of 630 nm. The FAI lenses consist of seven elements producing a focal length of 68.9 mm. The FAI imagers have a field of view of 26° and nominally point in the nadir (downward) direction on the spacecraft. Altitude profiles of the aurora can also be obtained by taking images of the night-side horizon, which makes use of the 3-axis stabilized platform of Cassiope. Each CCD contains 256 x 256 imaging pixels, giving the cameras a fundamental resolution of 0.1°, or 2.6 km at apogee for aurora at 110 km altitude. For greater sensitivity, the CCDs can perform on-chip binning resulting in 128 x 128 or 64 x 64 pixel images. The image quality of the backside-illuminated, low noise CCDs is further enhanced by the presence of thermal-electric coolers that reduce the temperature of the CCDs by up to 28° Celcius below the ambient baseplate temperature, which is usually around -5 C. When compared with today’s 10+ megapixel digital cameras this 0.065 megapixel imager doesn’t seem too impressive. However, the larger pixels of the FAI CCDs allow them to detect light levels well below those a comercial digital camera could detect, and even below levels human eyes can detect, making FAI ideal for low-brightness auroral emission imaging. The FAI imager system produces 16-bit digital images of the near infrared band at one image per second (again taking advantage of the non-rotating platform on CASSIOPE), and the 630-nm wavelength at two images per minute, giving adequate temporal resolution to investigate the above scientific objectives. The video below was taken on November 24, 2013, over Novaya Zemlya, an island north of mainland Russia. Cassiope was slewing FAI to a fixed target and was able to capture some beautiful, dynamic aurora. Data such as this can be used to reconstruct auroral forms in 3D. Note that this video is sped up 10:1. The next video was captured on October 9, 2014 when Cassiope was over Alaska, pointing FAI towards Fort Smith, in northern Canada. Again, note that the video is sped up 10:1. FAI was developed by a team of experts in partnership from the University of Calgary, Routes AstroEngineering (now COM DEV), Burley Scientific, Keo Consultants Inc, and JENOPTIK Optical Systems, Inc. The lead scientist for FAI is Andrew Howarth.